The city’s pension payments climbed steadily from a little over $5 million in 2000 to about $23 million in 2008. But the payments have remained at roughly $23 million since then, and increases forecast in the next few years are gradual. A 45-page budget analysis posted on the city website last week said “retirement costs” were 9 percent of the general fund in fiscal 2006-7, grew to 13 percent last year and are expected to be 15 percent in fiscal 2015-16. Retirement costs in Stockton, which filed for bankruptcy on June 28, are about 17.5 percent of the general fund. Retirement costs in San Jose and San Diego, where voters approved major pension cuts last month, are 20 percent of the general fund. “The reasons for our dilemma are multiple and long enduring,” San Bernardino Mayor Pat Morris, a Stanford law graduate and former judge, told reporters a day after the vote last week. The local economy took long-term hits from the closure of the Kaiser steel plant and Norton Air Force Base, news stories said, and the city is now a bedroom community with 15 percent unemployment and 43 percent on some form of public assistance. To fast-food aficionados, the old Route 66 city is the birthplace of McDonald’s, before the purchase by Ray Kroc, and of the Taco Bell prototype, first called Taco Tia by Glen Bell, whose employees were inspired to found Del Taco and Der Wienerschnitzel. An editorial in the San Bernardino Sun over the weekend called for an end to a political feud between Morris and city attorney Jim Penman, a two-time loser to Morris in races for mayor. “More than political rivalry, it’s come to drive the agenda, a maelstrom that drags down everything around it, polarizing the city’s leadership and paralyzing the process,” wrote Frank Pine, the Sun executive editor. The San Bernardino County Sentinel speculated in March that the election of councilman John Valdivia shifted the balance of power on the council from Morris to Penman. 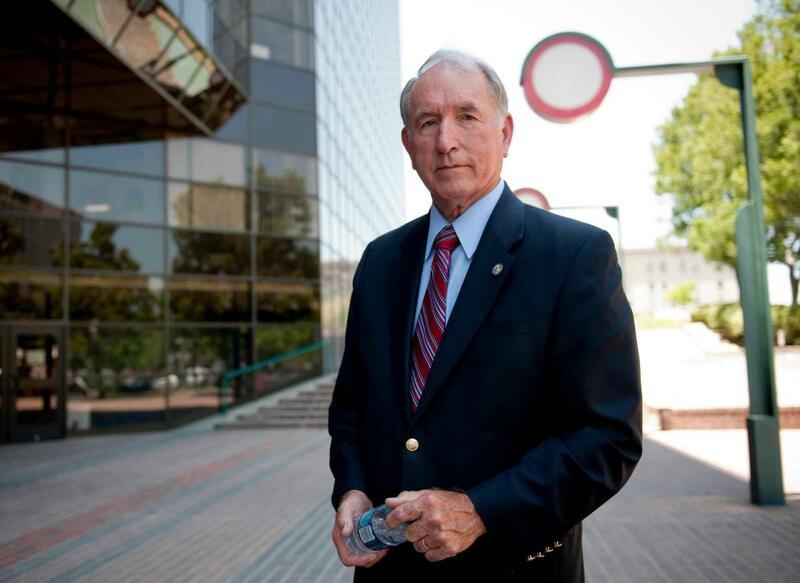 Morris unsuccessfully tried to change the city attorney from an elected to an appointed position, said the Sentinel, and Penman had his office investigate Morris and others for alleged violations of the political reform act. The Sentinel said one of the first council actions after the pivotal March election approved a previously blocked $939,000 supplemental appropriation to the city attorney’s office. Penman said last week that 13 of the last 16 city budgets may have been falsified, but he declined to reveal what he reported to authorities. Sheriff Rod Hoops told reporters he thinks a criminal investigation of the city is unrelated to Penman’s allegations. The 4-to-2 council vote last week (the mayor only votes to break a tie) authorized Penman to seek bankruptcy. Interim city manager Andrea Miller said the city may need a month to prepare a bankruptcy filing. Penman told the city council that Miller and finance director Jason Simpson, both hired in April, and an outside expert (an apparent reference to Michael Busch of Urban Futures) have not been involved in the political battles. To get bankruptcy protection from creditors before then, the city apparently would use the “fiscal emergency” provision in a new state law, AB 506, regulating municipal bankruptcy filing. A city council meeting is scheduled today. Stockton used the full period prescribed by the new law for mediation with creditors, 90 days, but was unable to get agreements on enough savings. The 45-page budget analysis prepared by the new financial team may raise questions about whether the city budget gap is being exaggerated to bolster the case for an emergency bankruptcy filing. A chart on page 14 shows general fund spending last fiscal year was about $140 million. In the new fiscal year, finance director Simpson said the general fund is expected to spend $166 million. Much of the increase is said to be due to the expiration of cost-cutting contracts with all unions except firefighters that saved $10 million and repaying money taken from internal funds for workers’ compensation, general liability and retiree health. Revenue is expected to be about $120.4 million, probably increasing with a $1.2 million federal firefighter grant in September. So the projected budget is roughly $45 million. But why the internal funds must be repaid this year is not clear, nor is the amount of effort made to get unions to continue the $10 million in concessions or give the city other savings. The report said the city has negotiated lower pensions for new hires: 2 percent of final pay for each year served at age 55 for non-safety workers and 3 percent at 55 for police and firefighters. That’s still higher than lower new-hire pensions negotiated by many employers. For example, most current state workers get 2 at 55 and new state workers will get 2 at 60. A famous trendsetting bill sponsored by CalPERS, SB 400 in 1999, moved the Highway Patrol from 2 at 50 to 3 at 50. Some employers are getting unions to agree to roll back new hires to the old formula, 2 at 50. The California Public Employees Retirement System formulas used by the city split pension costs between the employer and the employee. Like many other cities, said the report, San Bernardino has been paying all of the employee share. For police and firefighters the city share is 30 percent of pay, and the employee share is 9 percent of pay. For non-safety workers, the employer share is 17 percent, the employee share 7 or 8 percent depending on the formula. In union agreements in some cities, current workers are beginning to pay some of their share of the CalPERS payment, allowing the cities to reduce their pension payment by a similar amount. 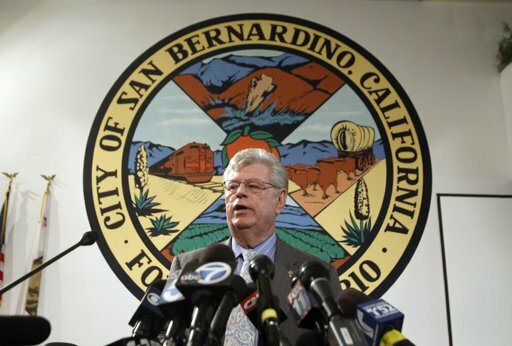 The new San Bernardino labor agreements only have new hires paying the employee share. The report suggests that the city could cut costs by urging current workers to pay the employee share or possibly even a 50-50 split with the city. Could bankruptcy be avoided by taking a harder line with unions, delaying repayment of the internal funds, raising revenue as suggested in the report or bridging the usual “dry” period in tax revenue with a loan or reduced paychecks to be backfilled later? A bankruptcy filing may get some challenges. But the city, battered by a changing economy and political infighting, apparently has allowed itself to slide into a deep financial hole. Simpson told the council that salary and benefits are expected to cost $126 million this year, exceeding the projected $120.4 million in revenue available to cover not only employee costs but other general fund city programs and services as well. But again there is no supporting detail. Attachments to the 45-page budget analysis that might contain crucial data were not posted on the city website for review by skeptical citizens. Some glitches raise doubt about whether the analysis was prepared with care. Page 36 begins in mid-sentence, “realized from the issuance of POBS,” with no apparent connection to the final sentences at the bottom of page 35. A reader might guess that the numbers are for retiree health care, which are not listed in the report. A chart on page 36 shows city pension costs climbing to about $23 million a year in 2008 and then leveling off. In one of several moves to give the public a better view of its operations, CalPERS (in addition to webcasting board meetings) has begun posting the annual pension valuations of more than 1,500 employers with 2,200 plans. The annual San Bernardino safety plan employer contribution for police and firefighters was 28.3 percent of pay last year, increased to 30.1 percent in the new fiscal year and is expected to be 31.9 percent in fiscal 2016-17. But that assumes CalPERS hits its old investment earnings target of 7.75 percent, lowered in March to 7.5 percent. If investments lose 3.64 percent a year, the employer contribution in fiscal 2016-7 is expected to be 46.9 percent. In California public pensions, the employer, and thus the taxpayer, is responsible for covering investment losses. The employee pension contribution is regarded by some as a “vested right,” protected by contract law, that can only be increased if employees get a benefit of equal value. This entry was posted on July 16, 2012 at 8:01 am and is filed under Bankruptcy, San Bernardino. You can follow any responses to this entry through the RSS 2.0 feed. You can skip to the end and leave a response. Pinging is currently not allowed. “But again there is no supporting detail. Attachments to the 45-page budget analysis that might contain crucial data were not posted on the city website for review by skeptical citizens. I do not see anything here that demonstrates any sensible direction or action taken by this city. If you look at what they are calling pension reform it is a complete and toatal joke, and taxpayers should be very offended. Here we go, instead of negotiating cost saving contracts they’ve more than likely done what all too many cities have done – call compensation deferrals contract reductions while allowing the employee groups to claim great sacrafice in the local media. Deferring compensation when you can’t afford the original contract, the ever increasing CalPERS costs, and the healthcare costs that are growing at 8.5% annually is just plain BS. Now the deferrals have expired while many other costs have continued to escalate and you have nothing but a mess because the originol issues were never addressed. I’ve seen employee groups claim they’ve saved 10 million because they’ve deferred raises that the city could never afford in the first place usually at the cost of extending the contract. What happens is the city is in worse shape when all is said and done and the employees are claiming “we did our part” while refusing to renegotiate and pushing for more taxes. First of all the reduced formulas are a joke. They don’t even approach or come close to the what is proposed under Jerry Browns 12 point plan. Secondly, the city is under zero obligation to negotiate anything with the unions regarding employees that haven’t been hired. The unions like to push this so the public thinks they’re making a sacrafice but it isn’t true – it is BS. The city likes to tell the little people they’ve negotiated reduced pensions because it makes them feel good but – again, BS. The negotiated formulas for people not represented by the unions – again, BS. – what a stinking mess. teabaggers still dream and tilt at windmills….good article though…….. I always question the teabaggy rhetoric gadflys with this: What other types of contracts do you think we ought to void when performance is inconvenient? …The lone and level sands stretch far and wide…… like Ozymandius ™ I never get an answer. Straight from the liberal media’s mouth. THAT’s not a “negotiation” result that represents taxpayer interests. With Public Sector workers earning no less in cash pay, there is ZERO justification for ANY greater pensions or benefits. Yet these “negotiated” pensions STILL have a taxpayer cost-share 2-4 times (4-6 times for safety workers) greater in value at retirement than what a Private Sector worker gets from his employer when making the SAME pay, having the SAME years of service, and retiring at the SAME age. What ……….. Are Civil Servants “special” and deserving of greater pensions and better benefits all while getting no less in cash pay ?????? Taxpayers …… renege on ANY FURTHER FUNDING odf these Plan until pensions and benefits for CURRENT workers are no greatert than what YOU get. Tell you city manager to send back CalPERS bill, NOT with a check, but with a NOTE saying we only have enough funds for essential service ….. and overcompensating Public Sector workers via these grossly excessive pensions is NOT essential. Did you folks hear today that CalPERS reported a 1% ROI for the last fiscal year??? But listening to Teddy and the gang everything is perfect!!! HAH! This ship is going DOWN, my friends!!! All pension hogs on board the sinking ship – PUT ON YOUR LIFE VESTS AND LOWER THE LIFE RAFTS!!! The pension hogs have reached the end of the road. No more room to kick the can. The cities are already raising their middle fingers to CalPERS. Laguna Niguel has ordered an investigation into CalPERS financial management. Beezyboob said–Did you folks hear today that CalPERS reported a 1% ROI for the last fiscal year??? Last decade less than 3%. heh. 7.75% average required for solvency. heh. Calpers fund value today— 234.3 bil baby !!!!!!!!!!!! Trolls Unite– you have nothing to lose but your chains! Here, Teddy. I got a present for ya. This guy is about 2000x’s smarter than you are. Listen to him. If 1% sinks in you should be very scared. Oh noooooo the sky is falling !!! Beezy hates the truth—- pension envy baby. True- the California Public Employees’ Retirement System earned 1 percent in the past fiscal year as slumping global stock prices dragged down the largest U.S. pension. But– private equity gained 5.4 percent. Calpers’ bonds rose about 13 percent and its real estate holdings climbed 16 percent. Calpers, as the fund is known, ended fiscal 2012 with $233 billion in assets, according to a statement today. The fund earned almost 21 percent in fiscal 2011, its best result in 14 years. They saw a 21% return in 2011 because the market cratered before that. Are you saying we want more crater years? The Calpers fund value today— 234.3 bil baby !!!!!!!!!!!! But how big are their liabilities? And since when was Jerry Brown a tea bagger? So– there ya go—— there are about 30k US cities….some will go bk, but not many because as I have said it’s expensive and ya still have to pay your debts and the litigation is mind numbing…. You make the Beezyboob ™ look like a bunker fool……. Ted, I would believe a gypsy fortune teller who accepts wooden nickles before I would believe your forecasts or predictions on anything. heh. You’ve only see the prelude to what’s going to happen. And when the avalanche comes down they will have no other option than to cut gov salaries and pensions severely. I am talking a 50%-60% haircut. More on pension over $100,000. If San Berdo was cooking it’s books you can be certain many others were too. Beezy— Let me be serious for a moment, ok? In time, when what you and I both know what will happen, we will be fully under Sharia Law ™. And as you know, I think it will be good for all of us. When this happens,all debts not pleasing to Allahu will be forgiven. Only if Allah is playing monopoly with funny money, Teddy. In the end someone is forced to pay the bill. Debt is never really forgiven. It’s just transferred to someone else. Math settles everything, Teddy. I know that you are a big fan of Krugman economics and fantasy math….but that’s just not how the world works. Government accountants don’t know how to subtract. They specialize in addition ……. until they can’t anymore. heh. BZ is a modest little commenter, with a lot to be modest about. At least I’m fact-based and not a bait swallower. LOL— OK Beezyboob—-(ocODDball) take the last word…..
BZ doesn’t know a fact or a mathematical analysis from a sack of rotten pig testes. spension right you are ! He’s a box of rocks….. Neither of you would qualify to carry my water or shine my boots. Clean the manure from your cranial cavity and submit another application for consideration. Shiny boots? LOL– I thought so…and probably a chrome helmet ! More proof that BZ has a lot more to be modest about than he recognizes. That anyone would be within one mile of his stench to carry his water or shine him is a scream. BZ’s best move is to stop posting, but in all likelihood, he gets paid by some interest group by the post. He posts for free for the black helicopter tin foil microwaive society! You are complimenting BZ overmuch. He thinks helicopters are flying monkeys and used toilet paper on his brow protects him from all… no need for foil.